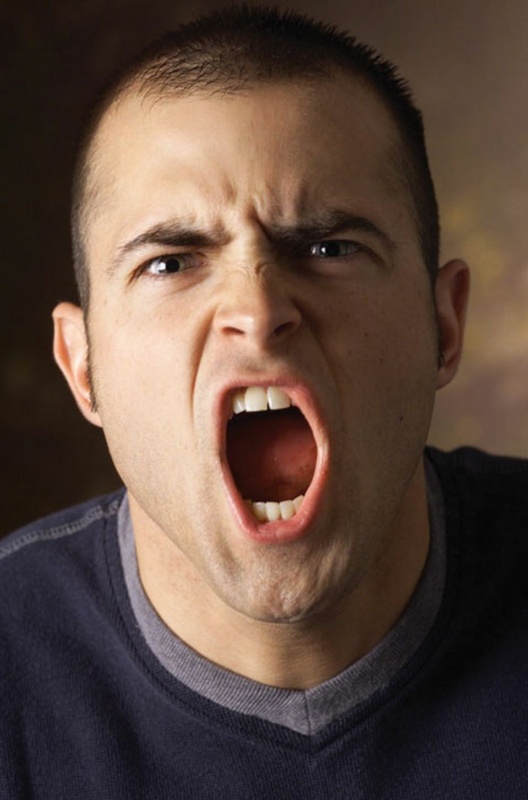 Aggressive people tend to act hostile: to destroy, to attack, to argue. Aggressiveness can be managed and unmanaged. If it is unmanaged, such an emotion is harmful, as any other. Often angry outbursts are the result of sleep disorders, feelings of stress, dissatisfaction or permanent conflicts with loved ones. When you feel that something you exasperated, try to stay at their actions and distance myself from the situation (move away from the person who is annoying on the street, go into the other room, etc.). Practice calm presence. The surface of the lake as it responds to the outside world? Yes it does: it simply reflects, and all. So you practice to perceive what is happening around, and not to react. And you can learn to translate aggression in another direction, for example on physical exercises. Do drums, sharp movements, exclamations. Good karate or any other martial arts. If you're angry at someone, try to put yourself mentally in the place of this man. Think about why he behaves and what he is right. Don't pay attention to minor stimuli. Try to live as though this day today is the last in your life. Don't blame the troubles of others. Try to forgive them, because the disadvantages of each. Terminate aggressive thoughts unpleasant action which is directed at myself. For example, biting yourself gently lip. After some time conditional reflex, which allows you to control the aggression.Or learn to put blocks on the impulses of aggression: select a word or phrase (e.g., "Stop"), and recite it to myself whenever I feel like taking off. Try to restrain yourself from rising voices: take a deep breath when you want to scream, and imagine exhaling the anger out of you. And only then start to communicate. Always, when you have violent thoughts, find three reason why this is unwise. Share your anxiety with someone you trust. Tell him your negative emotions, and it will be easier to cope with them. Keep a diary of your outbreaks of aggression. Write them down, and the circumstances under which they occur in the head and also your actions. Review your notes several times a week and analyze them. You will be able to understand them and to find out the cause of aggressiveness. To smile, find your anger at other people funny. Interrupt aggression, Recalling anecdotes and jokes. Learn to discharge nervous tension and relax. This could be meditation, sport, meditating, socializing with friends, relaxation music, etc. Relax. If you sleep a little, then manage by itself cannot be considered. Engage in revising their life values. You fight and scream not just because of the fact that overwhelmed with emotion but because he forgot about respect to other people. When you're ready to yell at the family member, friend or even a stranger, remember that they too have a right to dignity and well-being, as well as you.